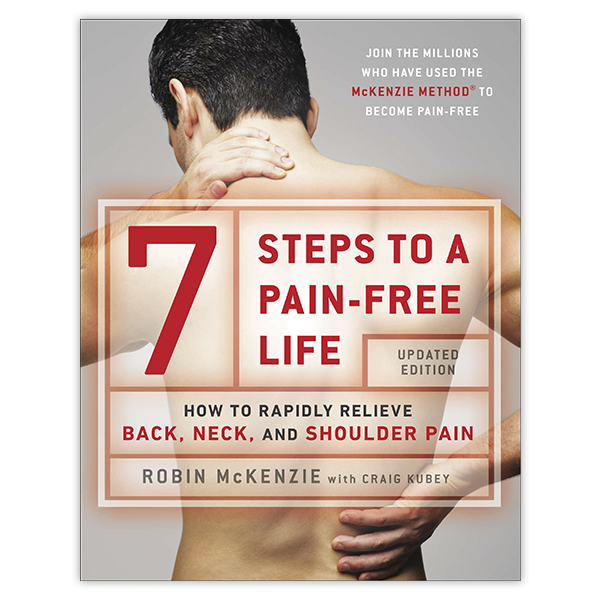 Learn how to rapidly relieve back, neck and shoulder pain using the McKenzie Method® and simple exercises from Robin McKenzie. 7 Steps to a Pain-Free Life is considered the treatment of choice by health care professionals throughout the world. In this revised and updated edition, Robin McKenzie covers common causes of lower back and neck pain, shoulder pain, the vital role discs play in back and neck health as well as easy exercises to alleviate your pain. Richly detailed with many photos demonstrating exercises and treatments. Written by Robin McKenzie with Craig Kubey. A physical therapist, working on his McKenzie certification, after an evaluation, had introduced me to the McKenzie method.. I will comment on the back pain section of this book, which is what I was most interested in. My physical therapist noted he had patients who had back pain for years that were over it in two weeks using the McKenzie method. Mine was not that fast, results may vary. And depending on your particular case, you may not be able to eliminate the pain completely, but may reduce it. The methods did help me avoid back surgery, which had been recommended. This book covers the McKenzie Method in detail, and also goes into things like posture, chairs, and other things that can impact your back pain, or avoidance of it. This method may not work in all cases, but the other information in the book about simple things to do such as before and after lifting heavy objects and avoiding injuries may still be valuable. It is well written and has photos depicting the simple exercises. If you have had back pain and other methods have not worked to reduce it, or are considering surgery, you might consider this book. As always, it is best to consult with your health care professional before making a decision about treatment. As my physical therapist had commented he found with others, I have had incidences where I hurt my back since my original physical therapy, and am able to use the simple exercises in this book to put it back in shape. The neck and shoulder sections may also help, and are written with the same clarity. They recommend an evaluation by a certified McKenzie therapist before starting a program. Considering the relatively low cost, this book can be good for some education and the information may help avoid back / neck/ shoulder problems. I might suggest also considering the Treat Your Own Back DVD in conjunction with the book.